The “why” stems from so many conversations that Tyson and I had while simply enjoying coffee together over the span of our marriage. Some have found our journey inspiring, not in the sense that they should follow our lead and pick up some livestock, but because God had given us a purpose and we went for it. 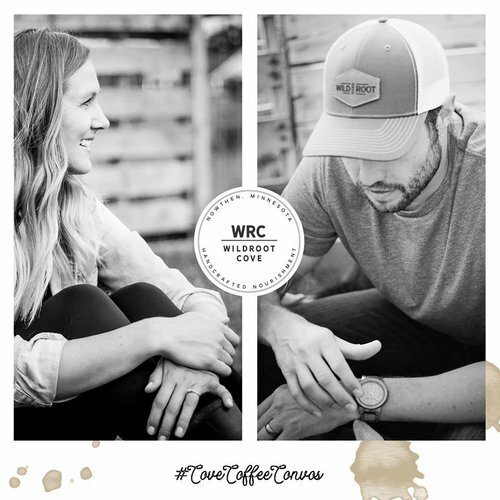 We decided to put our “why” out there in various posts called Cove Coffee Convos - you can read them below. Maybe you find it interesting to read or maybe it’s just left there, documented for me to look back on when I have a hard day here at Wildroot Cove. These posts will be sporadic and there’s no telling as to how many there will be as our “why” is still evolving. We dove into the deep end and reserved two bred goats before we even had a barn. We had less than five months to build the barn, install the fence, build hay feeders and gather supplies before the goats delivered. 8 p.m. would roll around and most evenings in our first years of parenting, Tyson and I would be able to relax and sit on the couch. I remember the night we felt like we were wasting time sitting there night after night watching TV. Not that anything is wrong with that – but we wished we shared an interest or hobby together. We knew that starting a homestead would mean work and there would be days we would have to trade in that down time, but we agreed it would be worth it because we would be doing it together. A couple years ago, Tyson and I were reading You and Me Forever by Francis and Lisa Chan, a study on changing our marriage to be more eternally-focused. As I started the first chapter, an old friend lost her life to cancer. Finishing up the last chapter, another friend passed away in a tragic accident. Both women were young moms just as I am. Both deaths were bittersweet as we can celebrate they are with their Savior. The point is... eternity. Landing ourselves on a larger piece of property also put us about 20+ minutes away from everything. I will often hear from my backseat, "I see hay bales, we’re almost home!" I like to imagine the world through her eyes and think about the moments she will cherish when she thinks back on her childhood. Hay will certainly play a significant role. Kenley loves the smell of hay. She will spend hours in the barn sifting through a bale to find the strands of timothy grass that the goats love. She knows she is close to home when she sees it outside her window.